The WEN 56200i 2,000 watt generator is powerful (79.7cc 4-stroke engine), compact (48 lbs. ), quiet (51 decibels), clean burning (CARB-compliant) and overall an excellent inverter generator that won’t break the bank. Yes, it’s very affordable because inverter generators are generally expensive but I consider the WEN 56200i a bargain considering the great features you get and the top-notch build quality. Note : WEN changed the styling for this generator for 2017, which may be confusing but the important thing to know is that the features are the same as the older styling. It looks like WEN has chosen an orange for their overall brand aesthetic and it’s reflected in the styling of their tools and power equipment. The older model had yellow as an accent color. WEN has designed a wonderful portable inverter generator with great features at an affordable price. If you look at their full product line you’ll realize that WEN customers are extremely satisfied because of the simple fact they provide excellent products that are affordable. The 56200i is no exception. 6 hours run-time at half-load. Whisper quiet operation (51 dB); as quiet as a normal conversation. ECO Mode: It automatically adjust its fuel consumption as devices are plugged in or removed from the generator. 79.7 cc 4-stroke OHV engine. Produces 2000 starting watts and 1600 running watts. Lightweight: (Product Weight) 48 lbs. / Shipping Weight: 54 lbs. Generates clean power (pure sine wave) enabling you to safely power your sensitive electronics. Includes: (2) three-prong 120V receptacles, (1) 12V DC receptacle and (1) 5V USB port. Total harmonic distortion to under 0.3 percent at no load and under 1.2 percent at full load. Low-oil and low-fuel automatic shutdown. Link two generators together using a parallel kit (WEN 56421) (sold separately). ✓ View or download the MANUAL for the 56200i. The WEN 56200i produces a pure sine wave and limits total harmonic distortion to under 0.3 percent at no load and below 1.2 percent at full load. Unlike conventional generators, this model is designed to safely run laptops, smartphones, computer monitors, tablets and all other sensitive electronics. The world runs on energy. Electricity is just one form of energy that we use in our day to day lives. We have become so dependent on electricity that we often take it for granted. Power outages however bring our dependence to the forefront. While many countries face frequent power outages, there are many people that are rarely affected by them. It doesn’t matter how often the power goes out because you can’t control that. The important thing is whether or not you’re prepared when it does actually happen. An inverter generator won’t power your entire home but it will make your life much easier and reduce your stress levels in an emergency, like keep your refrigerator running so all of your food won’t spoil. Inverter generators have a wide range of uses, that include: camping, RV Generator, tailgating, worksite, boating, power outages, and anything else where you’ll actually need portable power. Before we delve into the world of generators, it is prudent to get our concepts about electricity straight. Electric current is nothing but the flow of electric charge through a conductor. This conductor is usually a wire in most of our electronic circuitry. Very often we hear people referring to the current as AC or DC when they talk about electric current. These abbreviations refer to Alternating Current and Direct Current respectively. Alternating current is a current which periodically reverses its direction over time. It is usually represented as a sine wave. Direct current on the other hand is unidirectional. It was previously known as the Galvanic current. Direct current can be produced by batteries, solar cells and thermocouples. It can travel through conductors, semiconductors, insulators and even vacuum. The unidirectional behavior of the Direct current is the factor that helps differentiate it from the Alternating current. When we talk about electricity and generators, we are talking about a machine that can convert mechanical energy into electrical energy. The machine does this by using an external circuit. The source used to derive mechanical energy could be anything from a simple hand crank to a more complex internal combustion engine. An inverter generator produces alternating current (AC) power by converting the direct current (DC) power that it produces. Hence it is called an ‘inverter’. It is important to understand that inverter generators are slightly different when compared to the usual generators. Inverter generators are usually smaller than the conventional generators. As can be imagined, they weigh less too. That however isn’t the only difference. Normal generators produce AC power by using a mechanical alternator. Unlike the inverter generator, these conventional generators do not require a power conversion. Inverter generators can operate at variable speeds. Conventional generators on the other hand are restricted to constant 3,600 RPM. This makes inverter generators more efficient as they burn considerably less fuel. Another great advantage of the variable speed is the decrease in the amount of noise that the device produces. Inductive loads used by your microwave oven, and other motor driven devices and tools, will run faster, quieter and cooler with the pure sine wave generated by your inverter generator. Wireless Remote Start — Start or stop up to 80 ft. Love the transport handles. The modifications in the inverter generator ensure that there are no fluctuations in the power that are produced. That is why these inverter generators are considered to produce cleaner power. This is particularly useful when the power is supplied to sensitive equipment. Some examples would include high definition televisions, hospital equipment, laboratory equipment etc. Today’s inverter generators are being equipped with surge protection and ground fault circuit interpreters. This helps guard the equipment against shock, spikes, surges and blowouts. WEN has taken great pride in saying that the WEN 56200i is an inverter generator that is extremely quiet. In fact, they compare the level of sound that the WEN 56200i makes to that of a normal conversation. You have to admit that for any kind of generator that is pretty impressive! The WEN 56200i has an EPA III and CARB compliant engine. It is designed for use in campgrounds, tailgates, power outages and even construction sites! The WEN 56200i is equipped with a 4 stroke 79.7 cc OHV single cylinder engine. The engine also has a forced cooling system. It has a 1 gallon fuel tank. The running wattage and the surge wattage are 1600W and 2000W respectively. The engine of the WEN 56200i has a run time of 6 hours with half load. This means that inverter generator can provide a consistent source of power for about a 1/2 day, depending on the load. It will definitely get you through a night if the power were to go out. Easy to connect and to quickly increase your power when you need it. As stated before the WEN 56200i is small and light. The dimensions of the inverter generator are given in the table below. The wonderfully lightweight (54.4 lbs.) WEN 56200i makes it very portable and thanks to its whisper quiet operation this inverter generator can be also be used at campsites. Hopefully the campers beside you also have a quiet inverter generator as well. Loud generators are annoying and will quickly drive you crazy when they’re running. They’re worth the extra money for a lot of reasons. Shipping Weight : 54.4 lbs. *Read the MANUAL for more details. Knowing how to operate the WEN 56200i is paramount. An incompetent person operating this generator could have disastrous consequences as there are a number of safety precautions that one needs to take. Carbon Monoxide: Since the generator functions by using the combustion of fuel, it releases the byproducts of combustion into the atmosphere. One of the most deadly components of these byproducts is Carbon Monoxide. Since Carbon Monoxide is odorless and colorless, it is undetectable by the people in the vicinity. This is the main reason why people are strictly informed not to use the WEN 56200i indoors. The WEN 56200i should not be used in any place that is closed or lacks ventilation. Please note that using a fan or placing the WEN 56200i next to the window will not help the issue. The buildup of Carbon Monoxide in the air will gradually increase until it proves fatal to all those who are near the generator. Fire Hazard: Gasoline vapors are another thing that you need to be aware off. The WEN 56200i may release gasoline vapors when it is functioning. These vapors are highly volatile. It is for this reason that WEN advises the users to be very careful. The following guidelines will help ensure that the gasoline vapors do not ignite. Place the WEN 56200i on a flat and firm surface. Ensure that the device is stable before starting to use it. This will prevent any fluid or gas from escaping because the fuel tank is tilted. Refueling must be done only after the WEN 56200i has cooled down. WEN instructs the users to turn the generator off and to wait for at least two minutes before attempting to refuel. Ensure that you loosen the cap of the fuel tank slowly. This will slowly release the vapors into the atmosphere. The level of fuel that you put into the fuel tank is important. Do not attempt to overfill the tank. Remember there is an indicator for a reason. Excess gasoline in the tank will leave no place for the gases to expand. This will cause a significant increase in pressure in the tank and may result in an explosion. It may also lead to the spillage of gasoline which is also a big fire risk. Accidents happen and that is why it pays to be careful. Ensure that you check around the WEN 56200i to see if any of the gasoline has spilled when refilling the fuel tank. It is safe to start the device once you have finished this check. It may seem like a pain but always empty the fuel tank before transporting the WEN 56200i. The same holds true when it comes to storage. Lastly but most importantly, do not operate the WEN 56200i near any open flame. This also means that no one should smoke next to the device. Connections: The user needs to understand that the WEN 56200i produces powerful voltage. This voltage can result in electrocution. In order to prevent this ensure that the generator is grounded. The WEN 56200i should be connected to an electrical source directly. If that is not possible then an extension cord should be used. Under no conditions must the generator be connected to the building electrical system without consulting a qualified electrician! In highly conductive areas like steel work or metal decking, ensure that a ground fault circuit interrupter (also known as a GFCI) is used. You will find that some extension cords come with an in line GFCI. The use of these extension cords may prove to be productive. The WEN 56200i should not be used in rainy conditions as this increases the chance of shock and electrocution. It goes without saying that one must not touch any bare wires or outlets/receptacles. The use of the device should be limited to qualified people. Keep children away from the controls and explain the risks of tampering with the device to them. Risk Of Burns: Combustion produces heat. This heat can be felt at different parts of the WEN 56200i. That is why it is important to pay attention to the safety signs that are put on various parts of the generator. Do not touch these areas as they will cause severe burns. In case you need to touch the WEN 56200i, ensure that you switch the device off first. Allow it to cool before handling it. Can run up to 9.5 hour run time at 25% load. Parallel capability (Kit sold separately). Stackable design. ✓ View or download the MANUAL for the 73536i. ✓ To learn more, read our more recent indepth review of the : Champion Power Equipment 73536i. Another inverter generator worth talking about is the Champion Power Equipment 73536i. Like the WEN 56200i, the Champion Power Equipment 73536i is perfect for the outdoors. 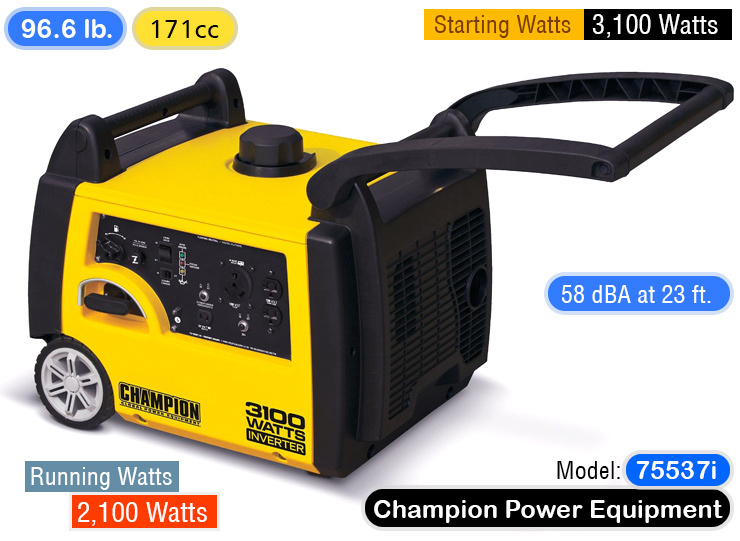 Champion Power Equipment claims that it is perfect for camping, traveling, hiking and even light jobs around the house. The Champion Power Equipment 73536i runs by using a 80cc OHV CPE engine. The specifications of the engine are almost the same as the WEN 56200i and that is why this is a great alternative to consider. It has a running wattage of 1700 W (compared to the 1600 W of the WEN 56200i) and a starting wattage of 2000 W.
The AC load that it can handle is 120V and it is a single phase generator. The fuel tank has a capacity of 1 gallon. The 73536i uses regular unleaded gasoline with an ethanol content of less than 10 percent by volume and a minimum Octane rating of 85. The oil used is 10W-30 4 cycle automobile oil. This means that the oil is freely available. Maximum total output of 3600 watts. The 73536i has a run time of 9.5 hours with just 25 percent of fuel. This just goes to show how efficient the engine is. The run time suggests that the fuel efficiency is high and hence you will spend a lot less when buying gasoline. The economy mode that has been incorporated in the 73536i, makes the engine automatically idle at a lower capacity when the electrical demand is reduced. This means that there is a decrease in the fuel consumption and the engine wear. That is why these products last longer and require less maintenance. CARB Compliant. Ultra portable with unique cube design. The safety instructions that are provided by Champion Power Equipment are similar to what WEN provides with its WEN 56200i. Champion Power Equipment instructs the users to be wary of Carbon Monoxide poisoning and not to use the generator indoors. It also warns the user about the risk of burns and shock while instructing the users how to avoid them. There are a few other important points that Champion Power Equipment talks about in their manual. Danger That Rotating Parts Pose: One very important point that Champion Power Equipment brings to the forefront is the danger that rotating parts pose. These rotating parts can ensnare hands, jewelry, clothes, feet, etc. That is why it is important to keep all your limbs at a safe distance away from the moving parts. It is also important to pay attention to your clothing. Do not wear loose clothes or drawstrings that can get drawn into the rotating machinery. Fire Hazard: The risk of an accidental fire is present with all kinds of generators. Champion Power Equipment cautions the users that the equipment has the potential to cause sparks. This is why no combustible material should be placed in the vicinity. The use of a spark arrestor reduces the risk considerably. In addition to this, it is wise to contact the nearest fire departments and consult them about the fire safety rules of the region. Having their emergency numbers at hand is always helpful in case of any emergency. Retraction Of The Cord: Many people instinctively pull the rapid retraction trigger of the cord without thinking twice. The starter cord of the machine tends to pull your hand towards the engine very quickly. It is wise to be aware of this before you try starting the engine. Pull the starter cord gently and slowly till you feel a resistance. Now pull rapidly so that you can avoid a kickback. Ensure that you do not start the device with any appliances plugged in. If this technique is not followed, you can cause grievous injury to yourself. Broken bones, bruises, fractures and sprains are the least of your worries. Traumatic amputation is also a potential danger. Losing a limb just because you didn’t follow instructions is definitely not worth it. So make it a practice from the very beginning and follow the technique that Champion Power Equipment gives. The Operation Of The Generator: Ensure that the 73536i is not overloaded. The generator should be started before any of the electrical gadgets are connected to it. When you do connect the gadgets, ensure that they are connected in the off position before flipping the switch on. The reverse is true when disconnecting the gadgets. Switch the device off before it is disconnected. The Champion Power Equipment cautions against making any modifications to the 73536i. Do not even attempt to tamper with the governed speed. The settings of the device have been set so that it provides optimal performance. In case of any issues, contact your nearest service provider. When you compare an inverter generator with a conventional generator you see the large number of benefits that the inverter generator has to offer. It almost seems like a no brainer except for one thing… The cost! Inverter generators are more costly when compared to their conventional counterparts. An inverter generator however will save you a great deal of money on fuel in the long run. This is because of its efficiency. At the end of the day you need to base your decision based on what works for you… A larger initial investment and a lower expenditure on fuel or a smaller initial investment and a higher expenditure on fuel! The choice is simple if you already know your budget.